For those of you who didn’t grow up (or have small children) in the 80s, the reference at the close of the previous post is to the cartoon Care Bears. 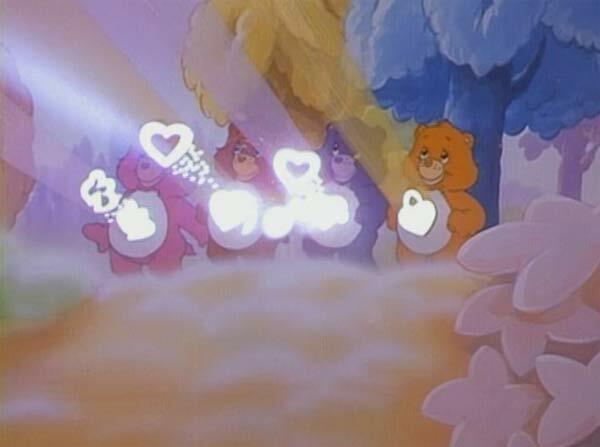 The Care Bear Stare was a sort of deus ex machina the magical furballs could employ when faced with some insuperable obstacle: They’d line up together and emit a glowing manifestation of their boundless caring, which seemed capable of solving just about any problem. In politics, Matt Yglesias has identified the neocon’s version of the Care Bear Stare, which he’s dubbed the Green Lantern Theory of Geopolitics. It holds that, like a Green Lantern’s power ring, the American military can produce just about any effect imaginable if only the Will of the American People is strong enough. When any foreign intervention fails, this is proof that our will was insufficient, presumably due to the malign influence of fifth columnists in the media. The left, of course, has its own version, which can be seen in claims that we know perfectly well how to solve problem X, if only we cared enough or had the political will to address it. A common variant holds that some vital function can’t be left to the market, since only government can guarantee the right result, presumably by putting the word “guarantee” somewhere in the relevant legislation. Feel free to use the photo above to tag instances of Care Bear Stare from either side. Update: Commenter John Cain points to an alternative illustration. Of uw site moet een facelift, of een sterke backlinking campagne gedaan, of u wilt weten hoe om te Zoekmachineoptimalisatie zoeken. tot succes maken. Het zou zijn als gevolg van zij gebrek aan informatie en tactiek. affiliate marketing programma’s in de industrie. Gemeenschap is volkomen eerlijk en transparant.